Beads have been used by cultures, religions and subcultures for personal adornment, communication and trade across the world. Today, we see beads used in artworks, jewellery making, embroidery, costume design and much, much more. We have recently started stocking an incredible range of beads and stones by Rico, so to celebrate the humble bead we take a quick look at its fascinating history, which spans thousands of years. In 2006 archaeologists discovered what is said to be the oldest surviving beads; small sea snail shells perforated with holes dated between 90,000 and 100,000 years old. 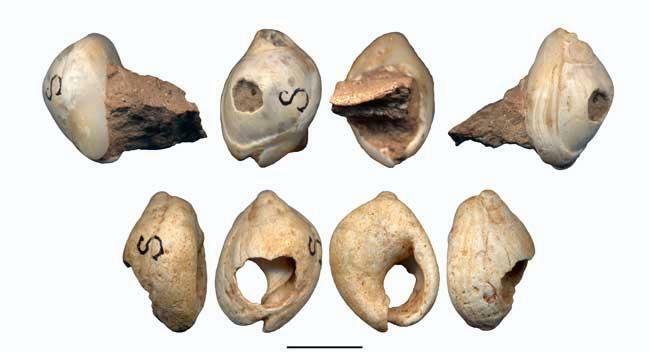 Located in Isreal and Algeria, the discovery of the beads so far from the sea, told researchers that they must have been either used for trade or collected by humans indicating that symbolic behaviour in humans dated back further than previously thought. Throughout the ages, beads have been used to convey symbolic, religious or even personal messages. 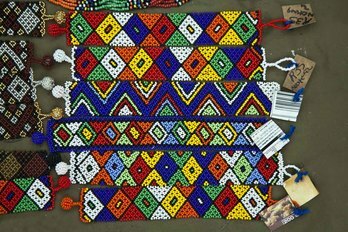 The Zulu people of Southern Africa have used beads as a way of conveying their marital status and their emotions; the colours and pattern design of the beadwork conveying symbolic and personal messages, such as whether a woman is single. In Zulu beadwork a triangle is used to represent female (pointing upwards) and male (pointing down). With each corner of the triangle being symbolic, the way it is represented within the beadwork can convey whether they are single or married. Colour is also hugely significant in Zulu beadwork and is used to convey positive and negative messages depending on the colour combinations. Before the advent of glassmaking, beads were made from natural objects and materials such as shells, seed pods, bone, clay, ivory and coral across the world by different cultures. During Colonial times, Europeans brought Venetian glass beads to the Americas and Africa to trade with. Trade Beads, or Slave Beads as they are often referred to, became a lucrative method of establishing trade routes for the colonial trading companies. here was no one type of style for Trade Beads, as they were made as per the taste and desire of whoever the Colonials were trading with. The beads were successful as a form of currency because glassmaking was uncommon at the time. Beadwork is archetypal of Native American tribes and is a tradition still practised today. The introduction of trade beads by Europian Colonists completely changed the way in which Native Americans worked with them. Previously beads had been handmade by a long process, after the introduction of glass beads, Native American's realised the creative possibilities of using these small coloured beads. Native American beadwork is a decorative art form and has been used on clothing, horse gear and for items found within the homestead. 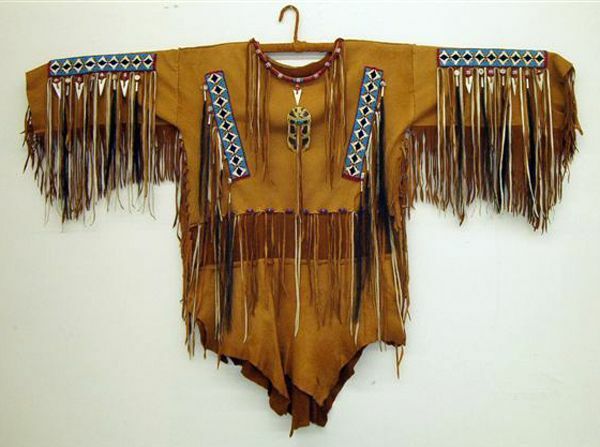 Designs were embroidered onto fabric or woven using a loom, the style and type of design varied from tribe to tribe. Although now the ways of life have changed for Native Americans, bead working traditions have continued and are an important part of their heritage. Today beads are used to express our identity in fashion and jewellery and used decoratively within textiles, craft and design. Beads are now readily available across the world in a whole host of colours, styles and sizes. In our next blog post, we take a look at tutorials that will help get you inspired to start beading!